Method Lab II | Choreo-Graphic Figures. 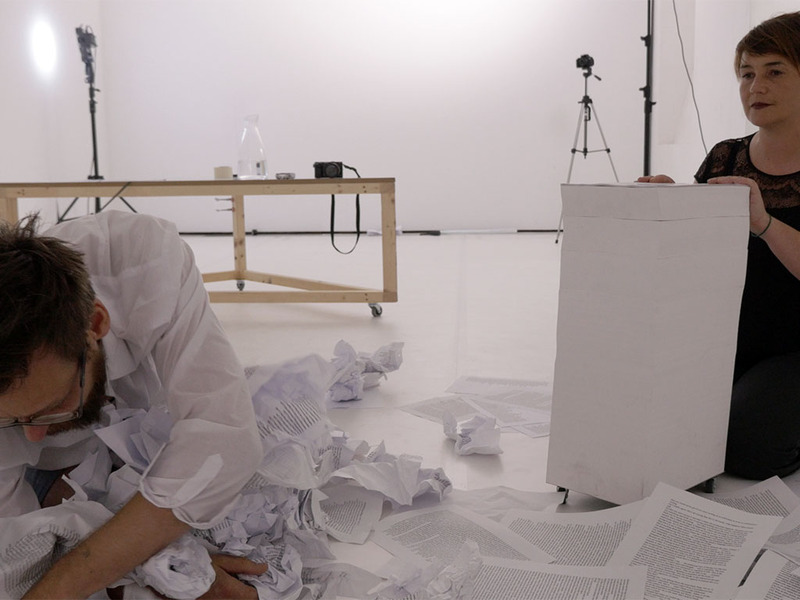 Figuring – we use the term ‘figuring’ to describe the small yet transformative energies, emergences and experiential shifts which operate before, between and beneath the more readable gestures of artistic practice. We ask: How to make visible this event of ‘figuring’; how to make the intangible tangible, to articulate that which is pre-articulation? What different systems of notation and annotation can be developed for marking and identifying the moments of ‘figuring’ within live investigative action? (Choreo-graphic) Figures — We seek forms of performativity and notation for making tangible and sharing the experience of figuring. We use the term ‘figure’ to describe the point at which figuring coalesces into a recognisable form, figuring’s dynamic vitality crystallised towards communicable content. We ask: how might the performed ‘figure’ be a system of notation in and of itself; re-activated in the hope of giving rise to the experience of figuring from which it emerged? 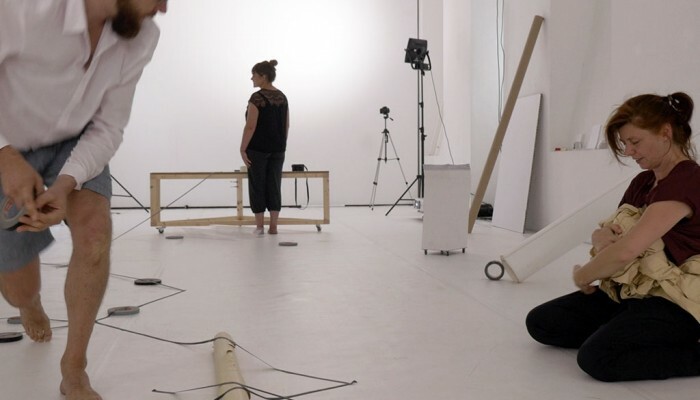 The shared research quest is both for a system of notation for honouring the process of figuring (as a live investigative event) and for ‘choreo-graphic figures’ for making tangible and communicating these significant moments within the unfolding journey of collaborative practice. (See: Publications – especially On Notation for further elaboration of the relation between figuring & the (choreo-graphic) figure. 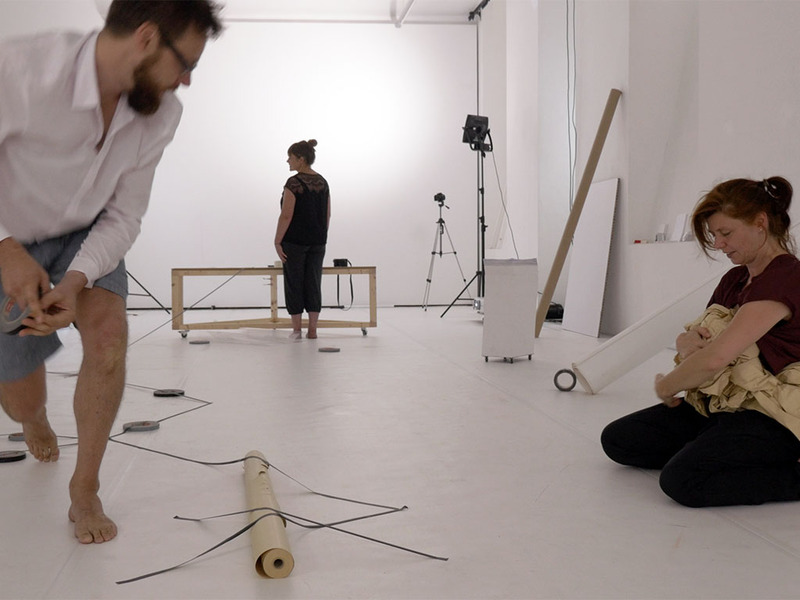 Framed as a research residency within the context of ImPulsTanz 2015, Method Lab II took place at AILab, Vienna, 13 July – 14 August 2015. The ‘lab’ comprised an intensive programme supported through the attendance of workshops and performances from within the ImPulsTanz programme, as well as through the involvement and provocation of project sputniks (Alex Arteaga, Christine de Smedt and Lilia Mestre) and critical guests (Werner Moebius and Jörg Piringer). Whilst the Method Lab evolved as an organic and iterative process, it is possible to discern two interrelated phases of activity. Phase I: In this first phase on the Summer Method Lab, we worked with our invited sputnik Lilia Mestre and invited guests Werner Moebius and Jörg Piringer, undertaking various Practices of Attention (including listening and vocal exercises) alongside a series of Live Explorations, to investigate the vibrant materiality of language and re-verberating voice. 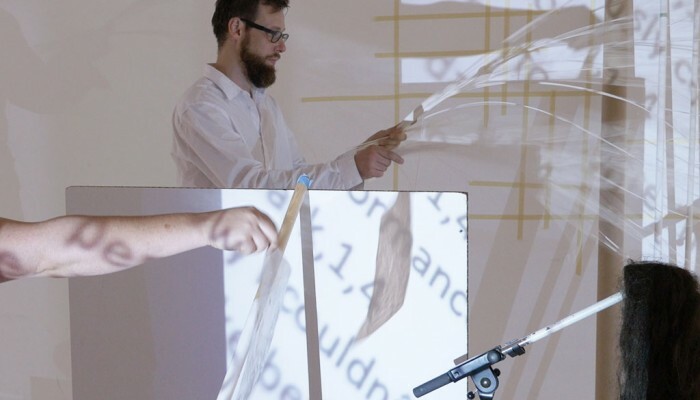 We are interested in the expanded forms of articulation that emerge by pressuring language through the filter of different modalities or sensibilities: the verbal-linguistic, the spatial-visual, the bodily-kinesthetic and musical-rhythmic. In this phase, our intent was to reflect on language’s plasticity, capacity, simultaneity, activity, sensitivity, intensity, potentiality, intersubjectivity, vitality, density, multiplicity, ambiguity, legibility, illegibility, performativity, synchronicity, curiosity, tonality, fragility, relationality, materiality, affectivity, sonority, temporality, ephemerality, musicality, opacity, visuality, corporeality, sensibility, physicality, fluidity, hybridity, receptivity, porosity, instability, occasionality […] Since Conversational / Dialogic Exchange is a central component within our working method, we wanted to find better means to fold this process back into both the Practices of Attention and Live Explorations – developing new ways in which ‘figures of speech’ might emerge through shared practice. Within this phase of enquiry we devised two key ways of folding Conversational / Dialogic Exchange back into the Live Exploration. (1) We revisited existing transcripts of conversation from our project using a series of ‘conversational analysis’ techniques, enabling us to identify specific recurrent ‘turns of phrase’ for further exploration. We attended to specific kinds of vocabularies emerging within our dialogues: for example, terms used for testing and questioning (sentences beginning with if, what, how etc. ); positional terms (sentences beginning with I, you, we, they etc. ); transitional phrasing (sentences containing phatic or lubricating ‘figures of speech’ such as ‘actually …’, ‘so to say’); comparative terms (specifically sentences which included the term ‘like’, used in the context of translation, ‘it’s like a …’ as well as for declaring preference and interest, ‘I like …” or “I don’t like …”. 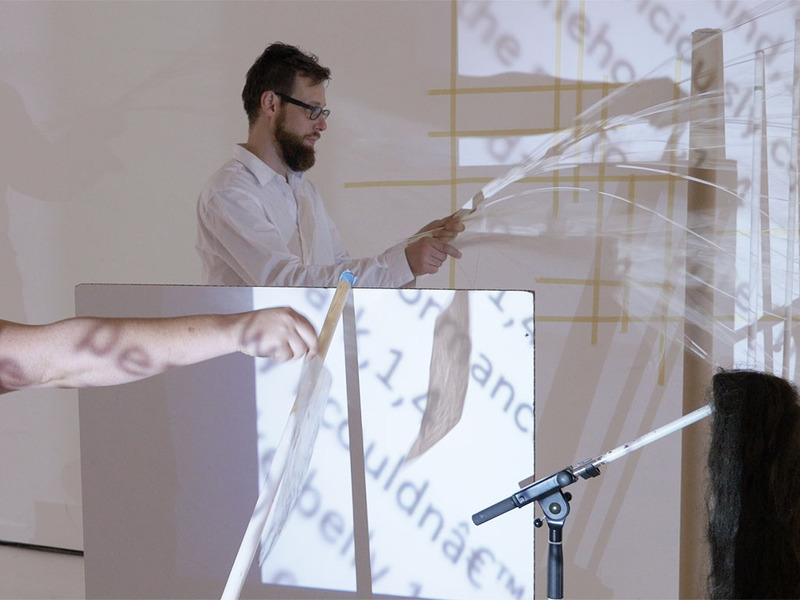 Additionally, we tested specific conversational analysis software and also printing technology introduced by Jörg Piringer, which enabled us to undertake live search and print operations within the context of a Live Exploration, creating instant ‘scripts’ in situ that could be activated verbally or used as working material. (2) We began to develop a model of conversational play using key words as provocation, based on a model introduced by Lilia Mestre. 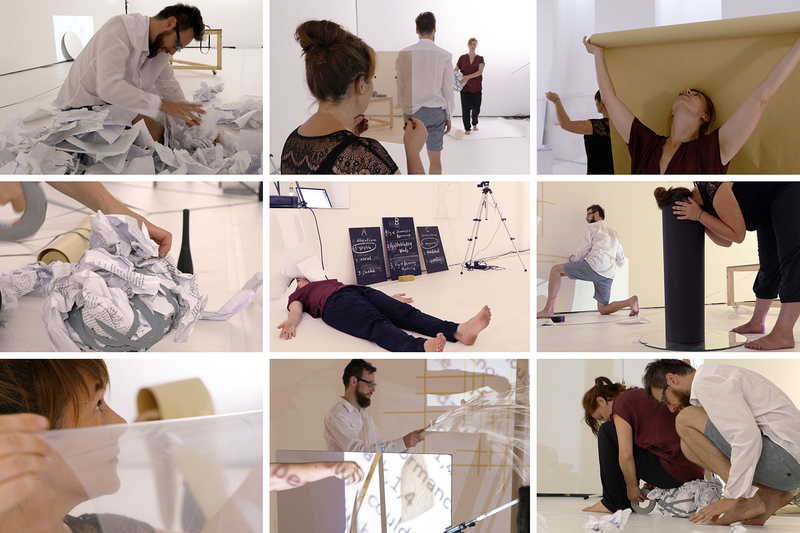 Within this phase, we shared our emergent processes through a public performance presentation on 25 July 2015, 15:00 – 19:00, and also through a half-day ‘open lab’ where we invited specific critical witnesses to engage with our process and offer us critical feedback. The critical witnesses invited were: Peter Kozek, Arno Böhler, Susanne Valerie Granzer, Anat Stainberg, Lisa Hinterreithner. (A) Practices of attention: for cultivating attention, perceptual awareness, sensory heightening or hyper-sensitizing, qualities of alertness and receptivity. We ask: How can we cultivate differentiated forms of attention? How do we prepare? (B) Live artistic exploration: during which we work together towards the embodied production of sensual knowledge, generated through live processes of exploration and experimentation. We ask: How can we use different questions, score structures, constellations and durations to put pressure on different aspects of our investigation? 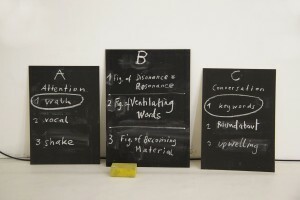 (C) Practices of conversation: conversation and reflection as material, site for the production of collaborative and inter-subjective ‘figures of speech’ and for initiating poetic modes of ‘sense-making’. 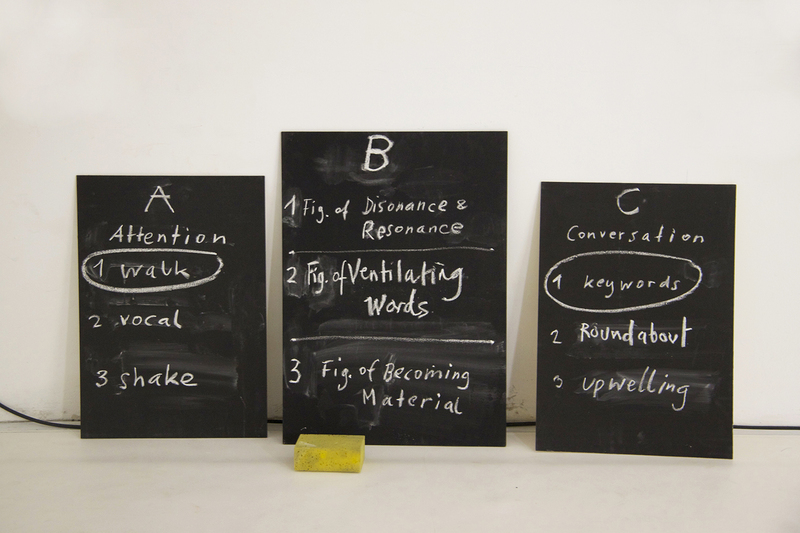 We ask: how can our conversations be folded back into exploration as material practiced as a kind of ‘performative conversational analysis’.